If you have only one day and you’re committed to seeing and doing almost everything, well, we’ve done it and we’re happy to help you enjoy Disney’s Animal Kingdom. While other Traveling Moms love Epcot or Magic Kingdom, this is my family’s go-to park and our favorite for many reasons. Once considered a “half day park” by some, Animal Kingdom has really begun to blossom. If you have just one day, we’ll show you a touring plan to spend each hour best! Many people scoff at Animal Kingdom, claiming it is a “half day” park at best. One can only assume these people hate stress-free fun. With the night-time additions to the park and the introduction of Pandora, you can squelch those claims. We’re here to say, it’s solidly a full-day park with plenty to ride, eat, and see. From sun up until well after sun down, you’re going to have a wild time here. It’s by far the best park for little kids, The lines tends to be shorter and there is plenty of shade. The zoological draw is perfect for distracting from afternoon tantrums. The best way to spend a day at Animal Kingdom is to break the day into chunks. Take breaks for meals. Then fill in the time when you’re roaming from one region to the next by appreciating the animals along the way. 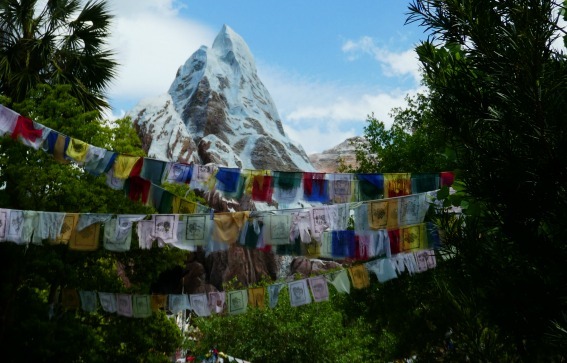 Expedition Everest is no longer king of crazy queues — Flight of Passage reigns supreme with wait times in the stand by line of three hours are very common. Here’s our take on the best way to spend just one precious day at Disney’s Animal Kingdom. If you’re lucky enough to be staying on-site at Disney’s Animal Kingdom Lodge — well — I’m envious. You’re in the best place you can be for getting to the park with ease and haste. Jambo House certainly has spectacular wildlife views and is very convenient for busing from the park. The other “Animal Kingdom resort area” lodging is Disney’s Animal Kingdom Villas – Kidani Village. Animal Kingdom is rather isolated from the other parks and not on the monorail. If you’re staying off-site, it’s best to have a rental vehicle. That way, you won’t have to rely on busing to the park. We stayed at Disney’s All Star Sports and had no problem getting there before the gates opened. But having a Zipcar made it easy. The All Star Resort Complex is very close to Animal Kingdom theme park, so you really can’t go wrong with great prices and proximal lodging. No matter where you stay, plan to arrive at Animal Kingdom before the park opens. You don’t need to go crazy, like the rope-droppers at Magic Kingdom–but you can score a private safari and other perks if you are one of the first in line. You can also plan to rush to Pandora from the gates if you didn’t score a FastPass+ for the Flight of Passage. A good 30 minutes prior to official opening is always good. Park and then plan to walk to the gate. The trolley that helps you get from the car to the gates is rarely faster than walking, especially if you have a stroller to fold up. 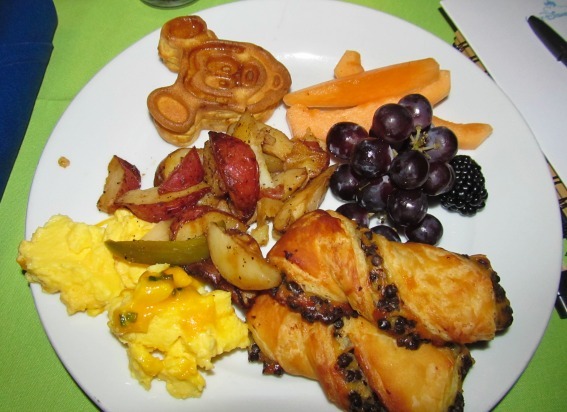 Part of the Disney experience is indulging in Mickey waffles and surprisingly delectable buffets. If you’re trying to save money at Disney — consider checking into the Disney Dining Plan — but don’t cut corners on the dining experience. Eat at at least one table service restaurant while you’re in the park! We really enjoy the O’Hana experience over a Disney’s Polynesian, but it’s a jaunt, so if you do not score an early dining time, you won’t make rope drop. 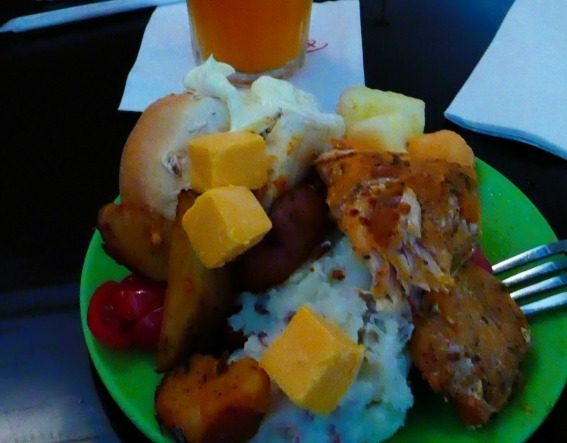 If you want to stick to Disney’s Animal Kingdom, Boma’s buffet is a good start to the morning. 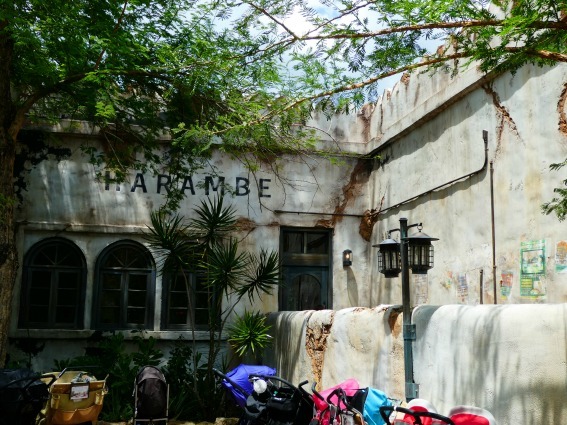 This privately run restaurant is a dining secret for those who truly love Animal Kingdom. It’s also a popular place to enjoy eating with small kids, since the animatronic creatures keep them on their toes. Disney Springs has a location, too. If you’re a die-hard and you want to circumnavigate the main gate, you can make reservations at the Rainforest Cafe and get into the park a tad early. 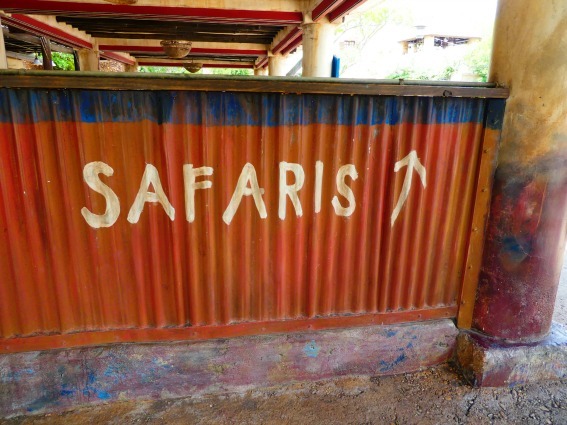 This “back door” to the park is a little known way to maximize your morning time at Animal Kingdom. This is a killer tip for those rushing to Pandora. You will still have to get through security lines, but you’ll make it past the initial gate before the rest by dining inside early. 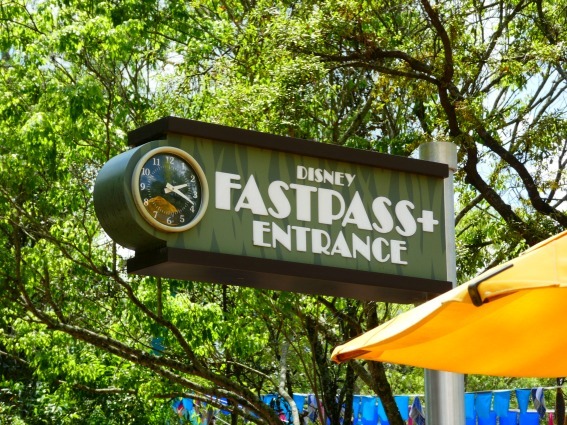 Use a FastPass+ to make sure you get your early morning ride. This is the BEST way to start the day. Enter Animal Kingdom and resist the temptation to be distracted by all the trails and monkeys. Just get on the jeep in Africa and go. Morning is a GREAT time to see more crepuscular animals before the heat of the day. Sure, they’re hailing from Africa, but no one likes to be beaten down by the mid afternoon sun. Many critters will be hiding out taking a siesta if you roll through later. TravelingMom Tip: While we believe if you stay the entire day at the park FastPass+ is NOT necessary, it sure is nice if you have small kids. It lets you jump the short lines even at a ride such as Dinosaur. It keeps the day moving and keeps meltdowns minimal. The Dinosaur ride is quite refreshing (literally, it’s cool with blasts of wind and cave-like darkness). But the rest of the Dinoland area is boring, especially if you’re not a small child. Tots, however, love to climb around and dig in the giant bonafied sandbox. Don’t get sucked into this sand trap for long. It is a drain on your precious time, ticking away. We seek dining opportunities in the afternoon. Everyone is getting tired and a little cranky. And it’s usually really warm outside. Find a restaurant to cool down and fuel up. It will help you push through the last half of the day! It’s important to have a good lunch if you had a quick breakfast. At least one sit-down meal is required to make it through a full day. We’re talking almost 12 hours in the park, on your feet–fuel up! We recommend lunch at Tusker House. Not only is it one of the best buffets in Disney’s Animal Kingdom but in the entire Walt Disney World Resort complex. Honestly, it’s one of the best buffets we’ve encountered in the United States. Truly! This meal is also one which features characters! To make things even more awesome they are in full safari gear. Expect Donald, Daisy, Mickey and Goofy to spend a few minutes at your table for great photos. While others are standing in line, sweating in the heat, you’re enjoying Peri Peri salmon and snapping selfies with Safari Mickey. You win! Just as it can be fun to visit the local farmer’s market in town, Harambe Market has lots of a la carte foods and fruits. This tends to be a healthier, quick option to fuel and go. Make sure to get yourself a Chicken Skewer for a reasonable, protein-packed snack while in Africa. It comes with black-eyed pea salad and green papaya slaw. Delicious and around $10. It can easily be something you split with a kid or a full meal for a light, healthy take on lunch. Festival of the Lion King is the performance to attend if you can choose only one. It is superior to Finding Nemo The Musical and is something you’ll be sad to miss. It’s also another place for respite from the sun. Though the benches aren’t the best, it’s a break from walking. Plan it into your day. Finding Nemo, while also good, lacks familiar songs (since there really aren’t many in the movie) and is quite loud. The brilliant colors make it another fine choice, but the slatted bench seats are abysmal. Flights of Wonder is indeed wonderful. But if you’ve seen a birds of prey show before, you can probably skip this one. If your kids are budding birders or if you’ve never felt the wake of wingtips from a flyover, make time for this. Plan ahead for it — times vary and you don’t have time to wait around! Kali River Rapids – If you’re hot, here’s an afternoon soaker. Most of the time, we disembark at least a little wet, if mostly on our feet. However, some rides have been real soakers. The underground tunnel where most of the queue is hidden is misty and dark, giving you some needed time in the shade. On a hot day, expect a wait. Consider using your FastPass+ here. Breaktime! Dole Whips all around! Arguably the best way to cool down at Animal Kingdom is by grabbing one of these tropical frozen treats and a bit of shade, with your feet up, people watching. A favorite place to wander slowly whilst enjoying a treat is the Tree of Life. Get up close. See how many animals you and your kids can point out and then keep that number in mind for later on in the night! Without a doubt, you will want to make this your FastPass+ priority. This is not exhilarating by any means, especially if you are comparing it to the other Pandora ride – Avatar Flight of Passage. But, this slow river float is a great way to cool off as it’s through a tunnel and the bright bioluminescent lights and jungle noises are soothing. Small children are fine here, however, there is an animatronic Na’vi being close to the boat on the righthand side, so stick any apprehensive kids on the left to be safe. Make sure to plan for this if you simply MUST see it. (And you should see it. It really is that good.) But, it’s got a fixed schedule and you’ll want to plan it with your meal time and other rides. Again, there’s no time to waste waiting around for the show to open. (obviously!) – Use a FastPass+ here if you want your party to stay together. If that’s not an issue, take the Single Rider lane! It’s always shorter! This is the one ride I absolutely recommending booking via FastPass+–twice. Get that coveted early morning AND sunset safari. I’ve taken the safari after pitch dark set in and you can see glowing eyes here and there. But at that time it’s mostly just a way to wind down from all the fun of the day. And, you should really be at The Tree of Life or Rivers of Light or in line again for Expedition Everest once it’s dark! Wildly popular with adults, you won’t find a character in sight here. It’s ALL about the food. Flavors of Africa. Serving breakfast as well, this is a buffet-style restaurant. With a wide array of African wines, you’ll want to get your Advanced Dining Reservations in early for this one! A great choice if you don’t want to waste much of your precious time. Bright and whimsical, this counter-service restaurant is near Discovery Island and offers a pizza-laden menu (naturally) but also has salads and flatbread concoctions that look delicious! The best part though, is the vibrant color and wild theme with murals and mobiles of birds, bugs, and even bats all over the restaurant–even the bathrooms! Yak and Yeti is another headliner for popular restaurant haunts in Animal Kingdom. Asian-inspired food items such as lo-mein, Mandarin Chicken Salad and egg rolls can be fitting while you’re in the Himalayas. However, most adults flock to the restaurant (which serves lunch and supper) because they also offer alcoholic beverages. There’s the signature Animal Kingdom Amber beer and one must wonder what would come of consuming a “Yak Attack!” Fun to say the least, it’s one of the things you should strive to check-off your life-list of things to do while in Animal Kingdom. If not for the food, then just for the fun of the themed counter service joint itself. Another fave at Discovery Island, Flame Tree BBQ is a carnivore’s dream! This is also one of the more scenic places to grub up at the park, as it overlooks the Discovery River. Birds or “plate robbers” as we affectionately call them, are a bit pesky here but will go far in entertaining the kids. That means adults get more time to enjoy the slabs of ribs and smoked meats. If you have the coveted FastPass+, this is a time you might want to use it. Expedition Everest After Dark is new as of last year and it is very popular. It’s a whole new take on the Yeti adventure and you won’t want to miss it. The newer “eternal sunset” lighting is a little bit reminiscent of the sunset scenes of the safari life of Simba in the Lion King cartoon, but didn’t impress our crew on the actual safari. Make sure to do the safari while there is still light. Otherwise, you might be lucky to catch the reflective glare from a few animals caught in the jeep headlights as you roll along, but little else. This is a magical, musical experience in which all the animals kids have been admiring by day come to life as they are highlighted at night. It’s an inspiring experience and is well-worth staying past sunset to enjoy. The Tree of Life Awakenings are newer as part of the “at night” programming. It is one of the experiences that must be enjoyed while in the park, even if it means derailing bedtime routines for one night. Occurring without a fixed schedule, it can take up to 20 minutes for the Tree of Life to come to life. These “Awakenings,” are projections on the tree in which the animals come alive. Remember counting them earlier in the day? Try to find new ones that you may have missed! The Imagineers outdid themselves with this and it’s truly magical to behold. TravelingMom Tip: Be warned, if there is especially cold weather in the winter months, you may be met with signs at animal enclosures that read “I can’t come out to play today!” (Or something to that effect.) It’s always a bummer when tigers or other large critters are not there. Make sure to have plenty to do if this is the case. You may also want to go to Kali River Rapids if you’re brave–cold weather means no line there! I have enjoyed Animal Kingdom twice: once with a kindergartener and another time with girl friend grandmothers and no kids. Third trip I’ll follow you ideas. So thorough! Thank you.